If I would have to name one thing that characterizes me the most, it would most probably be passion for self-education. Throughout my school days and university studies, at work and at home, I never stop absorbing knowledge, especially in all things related to travelling. I choose to work in travel because it gives me the opportunity to pass on my knowledge about the most exciting destinations worldwide, whilst also having a chance to be creative in the itineraries I put together. Multi-city flights, especially to Europe. 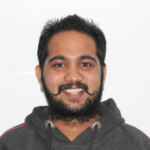 Parvesh is an easy-going person with impeccable sense of humor, however he is dead serious when it comes to researching flight deals for his customers. He brings tremendous focus and professionalism to all his assignments and does so with flair and enthusiasm. His remarkable ability to organize information and perform research is what makes Parvesh one of Top ASAP Tickets travel agents. Parvesh was helpful and provided a great customer service all the way through the process. Very Professional approach. Mr. Parvesh is the best! Parvesh strives to provide impeccable service to each and every customer and highly appreciates your positive feedback!